Yamaha MTX (EN) | PRO MUSIC, s.r.o. MTX Series processors come equipped with a variety of programmable features designed to maximize the performance of sound systems in commercial installations. With a focus on reliability and worry-free operation, functions such as Feedback Suppressor can automatically locate and eliminate acoustic feedback, while Auto Gain Control maintains a constant output level when input signals vary. For ancillary applications or environments that require public speaking, MTX processors feature a Priority Ducker function which automatically attenuates the output level a specified amount when the input signal from a separate sound source exceeds its threshold— as well as an Ambient Noise Compensator which adjusts system gain to compensate for fluctuating background noise levels. Combined with an onboard speaker processor for optimized speaker performance and sound quality, the MTX Series makes it easy to design and configure a complete audio system from input to output. 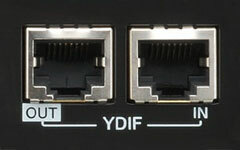 MTX processors feature the newly developed YDIF digital transmission format; a unique proprietary Yamaha technology that delivers 16ch audio and word clock transmission via standard CAT5 Ethernet cable. YDIF can be used for cascading multiple MTX Series or for feeding audio signal to XMV Series power amplifiers with very simple cabling up to 30 metres. The MTX Series feature an input/output configuration that is ideal for a wide range of applications: 8 mono inputs (mic/line), 2 stereo inputs (line) and 16 digital inputs via YDIF. The output side consists of 8 line-level mono outputs and 16 digital outputs via YDIF. 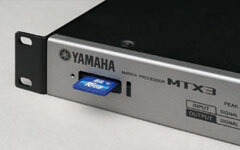 MTX processors also feature an SD Card Slot for playback of MP3/WAV files stored on an SD Memory Card. The Event Scheduler function allows you to play back these files as music, announcements or chimes—or even trigger external devices with a GPI output—at scheduled times, as well as recall presets stored within the MTX. 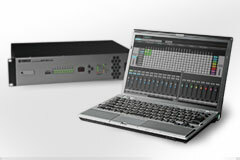 Dante is the latest audio network technology from Audinate, designed to deliver multi-channel, uncompressed, low-latency digital audio to multiple locations over relatively long distances. Equipped with an on-board Dante port, MTX5-D processors can send and receive up to 16 channels of digital audio using a single Ethernet cable. 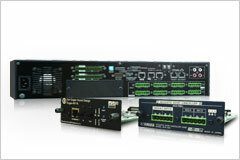 MTX5-D processors connect easily to other Dante-enabled devices such as CL Series mixers or XMV Series power amplifiers, making system design and configuration much simpler for larger venues. MTX5-D processors offer further expandability via a MY card slot—easily adopting many other digital network and audio formats or processing capabilities such as AEC (Acoustic Echo Cancellation) and auto mixing. The MTX Series comes equipped with two digital effect processors which are useful for entertainment applications— particularly party or banquet rooms. “Reverb” and “Echo” can be programmed easily using MTX Editor, eliminating the need for additional outboard gear. MTX Editor is a software application that lets you to design your system and adjust parameter settings via an intuitive interface that follows a workflow based on the system's configuration. MTX Editor also features optimized parameter presets for specific models of Yamaha speakers to maximize their performance. It is possible to connect up to eight units of DCP controller by using daisy chain connections of up to 200m. And, it is possible to extend the connection distance by reducing the number of DCP series that are installed as below. When using 2 or 3 DCP controllers in a commercial space which has a wide floor, a simple daisy chain connection is effective. 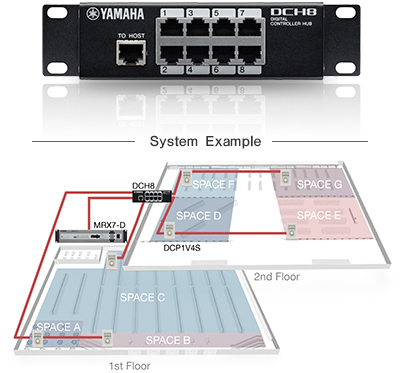 When using more than 4 DCP controllers in a wide commercial space over more that one floor, a flexible topology (combining Daisy chain and Star connections) can help to extend the „total“ cable length by combining a DCP series with DCH8. 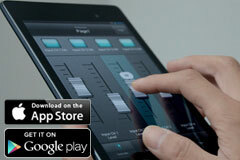 The Wireless DCP app for iPhone or Android devices allows you to remote control the MTX/MRX series. Since the Wireless DCP has the same function as the DCP series, you can control the MTX/MRX series via your smart device at any place in the restaurants, banquet halls and so on. * Wireless DCP can be downloaded from Apple’s App Store and Google Play at no charge. (Apple, iPhone and iPod are trademarks of Apple Inc., registered in the U.S and other countries. App Store is a service mark of Apple Inc. Android and Google Play are trademarks of Google Inc.). 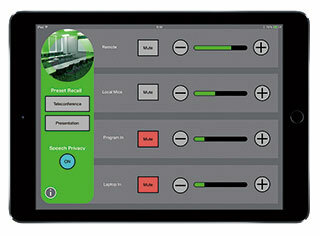 This handy iPad application allows MTX/MRX system control via a Wi-Fi network. A variety of control widgets can be arranged as required to create custom control panel layouts that are ideally configured for individual systems. *ProVisionaire Touch can be downloaded from Apple’s App Store at no charge. (Apple, iPad are trademarks of Apple Inc., registered in the U.S and other countries. App Store is a service mark of Apple Inc. ).